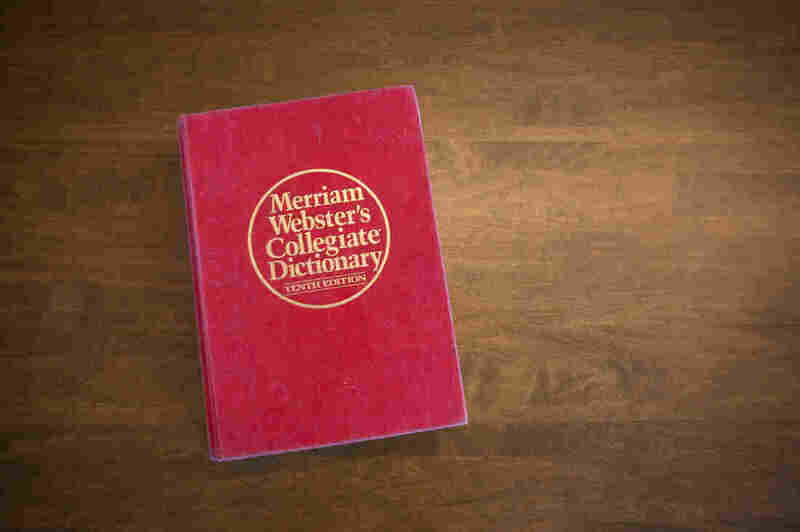 The Merriam-Webster Dictionary Has Been Trolling Trump On Twitter For Months : All Tech Considered Throughout the presidential campaign, the linguistic institution developed its funny style of delicately poking at Donald Trump and his associates on Twitter. Merriam-Webster's Twitter account weighs in on trending words and phrases and has waded into linguistic matters in politics, including a big campaign question: Did Donald Trump say "bigly" or "big league"? Merriam-Webster has a message for the Trump administration: There is no such thing as an "alternative fact." There are facts, and then there are falsehoods. That memo was at least implied this week when the dictionary publisher tweeted the definition of a fact just hours after Trump adviser Kellyanne Conway appeared on Meet The Press and referred to statements by White House press secretary Sean Spicer about the inaugural crowd size as "alternative facts." Later, Merriam-Webster threw another dig at Conway by tweeting an alternative definition of the word "fact." The idea for those tweets came from the dictionary's Trend Watch feature, Lauren Naturale, social media manager at Merriam-Webster, told Vox.com. When people are looking up a word at a higher rate than usual as related to an event, Merriam-Webster shares that trend and adds context on the word's meaning and how it was used. "Four people were involved in writing and editing the 'fact' article, and none of us felt like we shouldn't report the story — choosing not to report that trend would have been much more political than continuing as we always have," Naturale told Vox. "If you don't believe that words matter, why are you consulting a dictionary?" On Monday, Merriam-Webster subtly scolded the Trump team again, this time in response to a spike in searches for the word "claque." The searches were likely in response to reports that the people who cheered Trump during his visit to CIA headquarters were not actually agency staffers but Trump supporters invited for the occasion. These types of tweets are nothing new for Merriam-Webster. Throughout the presidential campaign, Merriam-Webster developed its funny style of delicately trolling Trump on social media. When Trump accused China of stealing a U.S. drone back in December, calling the act "unpresidented," Merriam-Webster's Twitter account mocked the president-elect for misspelling "unprecedented" and making up a new term. Trump corrected himself and deleted the tweet, but by then Merriam-Webster had already tweeted "Huh" as its word of the day. During the presidential debates, Merriam-Webster also threw some shade at Trump's unique rhetoric. After Trump's comments referring to "bad hombres," the dictionary's site saw a surge in searches for the word "ombré" but was quick to point out the difference between the two words. "Hombre" is the Spanish word for "man," while "ombré" refers to "having shades or colors that fade into each other." And the dictionary publisher attempted to set the record straight on a major perplexing question of the campaign: Did Trump say "bigly" or "big league"? Merriam-Webster highlighted that "bigly" is in fact a real word, but concluded that Trump was using "big league" as an adverb, which is uncommon. Despite all of this mocking, Naturale clarifies that Merriam-Webster's social media strategy goes beyond that. She says it reflects Merriam-Webster's quirky identity while furthering its goal of sharing knowledge as experts on language. On Sunday — one day after the Women's March drew millions of people worldwide — Merriam-Webster tweeted the definition of "vanguard" with a GIF of Sylvia Rivera, a transgender activist. "Smart people are curious about the world, and smart people are curious about the other people who live in that world," Naturale told Vox. "Our Twitter reflects that attitude."